The present Survey is the twenty-seventh in a series of reports prepared annually by the secretariat of the Economic Commission for Asia and the Far East (ECAFE). A major object of these Surveys, and the quarterly Economic Bulletin, is the analysis of recent economic developments in the countries of Asia and the Far East, and of international developments that affect them. Particular attention is paid to the analysis of economic policy and policy issues. Since 1957, in addition to review and analysis of developments in individual countries of the region, it has been the practice of these annual Surveys to examine specific problems concerning- the economies of the region in order to study long-term trends and their implications for national policies. 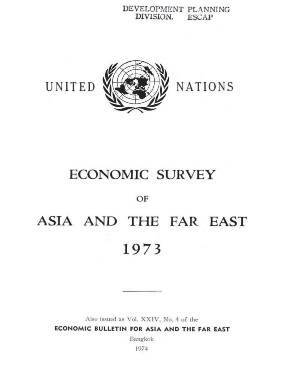 The First Biennial Review of Social and Economic Developments in ECAFE Developing Countries during the Second United Nations Development Decade printed in Part One of the 1972 Survey raised the question of “education and employment” as an important element of the general problem of mass poverty, unemployment and underemployment facing the developing countries of the ECAFE region. Accordingly, Part One of the present Survey is devoted to an in-depth study of the problem of education and employment. Part Two of the Survey contains a review of the current economic situation of 28 countries of the region. The Survey is published on the sole responsibility of the ECAFE secretariat; the views expressed should not be attributed to the Commission or to the Governments of member countries.